Donna Bell learned that being a smart saver can really pay off. Neighborhood Credit Union President Chet Kimmell (left) surprises Donna Bell (right) of Plano with a $10,000 prize as a reward for her good savings habits. I’ve never won anything like this in my entire life. Someone said I might be getting a puppy or a toaster! Being a dedicated saver can sometimes bring unexpected rewards, one Plano woman learned. 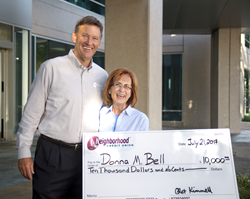 Donna Bell started her work day meeting Neighborhood Credit Union leaders at her office only to be surprised with an oversized “check” for $10,000. The actual $10,000 prize was deposited directly into her Prize Savings Account at the credit union. She was overjoyed saying she was glad she came to work that day. Bell, a member since 1982, said she will practice what she preaches and put some of her winnings into savings. Dallas-based Neighborhood Credit Union established the Prize Savings Account in 2007 to encourage people to save more money, at a time when the personal savings rate had dropped to one of the lowest levels in U.S. history. In addition to paying market-rate interest on the savings, Neighborhood Credit Union incentivizes good savings habits by awarding a variety of prizes throughout the year, culminating with the grand prize at the start of each new year. The more a person has saved in his or her Prize Savings Account, the more chances he or she has to win a prize. The grand prize has been $25,000 for the past eight years, but almost doubled to $49,999.99 this year. When asked what advice she had for others, Bell said to try and always be in the habit of saving. How the Prize Savings Account works: Neighborhood Credit Union members receive one drawing entry for every $25 monthly average balance in their Prize Savings Accounts. The greater the savings, the greater the chance a member has of winning. Members are eligible for monthly drawings up to $5,000 and quarterly $10,000 drawings. At the start of each year, a winner is drawn for the newly-increased $49,999.99 grand prize based on the average monthly balance in the savings account at close of business December 31.